JEE Main Previous Year Question Paper pdf: As you know JEE Main Exam will be conducted twice in a year from 2019. It will be also conducted by NTA (National Test Agency). There are no major changes introduced in the syllabus and Exam Pattern but still, there are possibilities of Change in the Exam Pattern and level. You will need preparation stuff for your Preparation. and That’s why we are providing Previous Year Question Paper and their answer sheet here. NTA JEE Main Previous Year Question Papers are very helpful for the preparation. It shows the level of the paper, sections, and also the Marking Scheme. It is also beneficial for candidates who are trying to improve their speed and efficiency. Here are the Last 4 Year’s JEE Main Previous Question Paper pdf. JEE Institutes also releases the answer keys of the JEE Main Previous Papers. And we have found Answer Key for the Year 2018 and 2017 by Aakash Institute. Questions Papers are already given above. 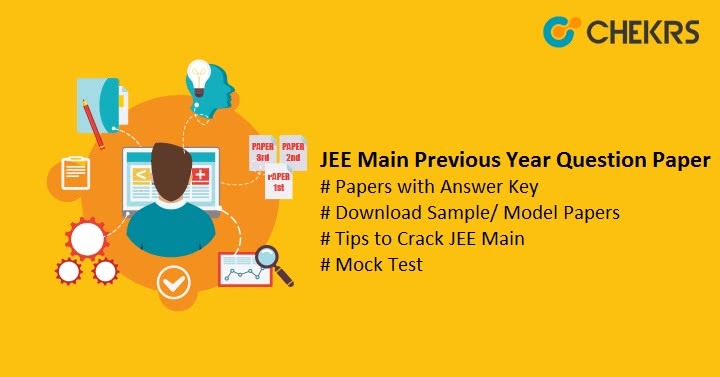 Now Start Solving the JEE Main Previous Year Question Papers and after solving them match your Answers and Note down your Mistakes. Many Institutes and Online Study classes release their own JEE Main Sample/ Model Papers. These model papers help students in many ways like it helps to understand the paper pattern better than before, It helps us to improve our skills, performance, and efficiency. JEE Main Sample Papers will be available on the official website of these JEE Main institutes/Classes. Basically, the Model/ Sample papers are prepared with the help of previous years question papers or the JEE Main 2019 Syllabus. To Crack the JEE Main Exam first of all you need to Collect all the Helpful Stuff like Syllabus, JEE Main Exam Pattern, Previous Year Question Papers with their answer key. Second thing is that fix a Time Table for the preparation/Study. Manage your time, and give equal importance to Study and Health. Start your Preparation From now, So you will get enough time for revision. Mock test/ online tests are equally important so try to include them also in your preparation plan. To find them just search it on search engines and access reputed sites. Solve JEE Main Previous Year Question Paper and match your Answer, Note down your mistakes, Learn and solve them. Make notes and use the diagram and flow chart as much as possible. These will help you to remember studied things better. Give equal importance to each topic of the syllabus, so nothing will be left. Also, do the revision of completed topics. Take care of Formulas and procedure to use them for all numerical questions. Eat well take rest in an interval and try your Best. Take proper rest before Exams. So You will not feel tired in the exam. Attempt questions carefully and try your Best. I hope our article will help you to understand the JEE Pattern and paper better. Make sure to cover complete syllabus and solve Previous Year Question papers. You can also prefer some Best Books for JEE Mains 2019 and JEE Mains Preparation Tips 2019 before the exam. Do Well, Good luck.